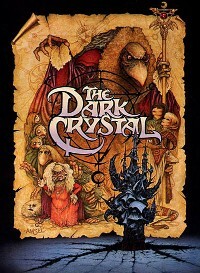 Art Opening & A Movie Presents THE DARK CRYSTAL (1982); Dir: Jim Henson and Frank Oz; Conceptual Designer: Brian Froud; Starring Jim Henson, Kathryn Mullen, Franz Oz; “The Small Game of Revilo”art exhibition featuring works by Brian Colin; also appearing will be Heidi Arnhold, artist, LEGENDS OF THE DARK CRYSTAL. Tues. June 7, opening reception 8-11 PM with movie at 9:30 pm; Fri. June 10 at MIDNIGHT; Sun. June 12 at 3 PM; Plaza Theatre; Trailer here. Jim Henson was at his creative peak when THE DARK CRYSTAL first hit theaters the week before Christmas in 1982. His Muppets were already firmly established cultural icons thanks to over a decade on SESAME STREET, five seasons of THE MUPPET SHOW, numerous television specials and two feature films. The song “Rubber Duckie” (sung by Henson as Ernie from SESAME STREET) had spent seven weeks in the Billboard Top 40 in 1970. Kermit the Frog had even filled in for Johnny Carson as guest host of THE TONIGHT SHOW in 1979, for God’s sake. And despite the mass-market, multigenerational appeal of the Muppets, Henson’s bearded genius was still, and always would be, artistically sound. This is likely because he never considered what he did as an entertainment exclusively for children. The original producers of SATURDAY NIGHT LIVE agreed and featured “adult” Muppets in their own skits during the show’s inaugural season. Jen the Gelfling pauses in a beautiful place on his quest to restore THE DARK CRYSTAL. Sony Pictures Home Entertainment. There would be additional triumphs on television and in film before his unexpected death in 1991, but THE DARK CRYSTAL stands as Henson’s greatest achievement. The movie tells the story of Jen, the world’s last hope to end a thousand-year reign of evil and bring harmony back to the universe by returning a lost shard to the cracked Dark Crystal. “Of all projects that I’ve ever worked on, it’s the one that I’m the most proud of,” he said at the time. Sure, he probably said something similar at LABYRINTH press junkets four years later, but THE DARK CRYSTAL achieves more without the benefit of a single human performance on-screen. Not to mention the charisma of David Bowie. 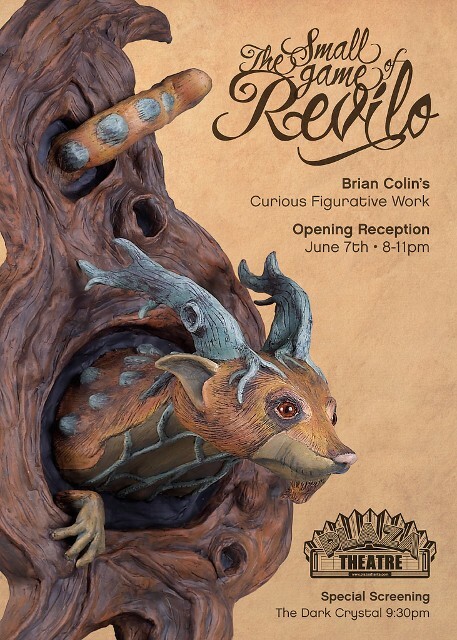 Art Opening & A Movie Presents THE DARK CRYSTAL (1982); Dir: Jim Henson and Frank Oz; Starring Jim Henson, Kathryn Mullen, Franz Oz; “The Small Game of Revilo”art exhibition featuring works by Brian Colin; also appearing will be Heidi Arnhold, artist, LEGENDS OF THE DARK CRYSTAL. Tues. June 7, opening reception 8-11 PM with movie at 9:30 pm; Fri. June 10 at MIDNIGHT; Sun. June 12 at 3 PM; Plaza Theatre; Trailer here. With the popularity of Yoda and the success of stop-motion movies like NIGHTMARE BEFORE CHRISTMAS, it may be hard to imagine how revolutionary THE DARK CRYSTAL actually was when it came out in 1982. Long before CGI, Muppets creators Jim Henson and Franz Oz wanted to show the celluloid potential of puppetry—they even billed it as the first live-action movie with no humans on screen—and take fantasy. So they came up with a mythic tale that provocatively took place in “in the age of wonder,” in which two noble, elf-like Gelflings set out on a quest to a fulfill a prophecy that will free their world from the grip of the evil Skeksis. For the imaginative character designs, they turned to fantasy illustrator Brian Froud, with whom they would collaborate again on LABYRINTH (1986). The project was highly anticipated by science fiction and fantasy fans and won some critical acclaim, but sadly tanked at the box office. Like BLADE RUNNER (also 1982), DARK CRYSTAL was perhaps ahead of its time and destined to gain more appreciation with age. The fantasy film is the latest in a parade of under-appreciated and cult features which the Plaza Theatre has brought back to the big screen. If you’ve only seen it on a TV screen or haven’t seen it at all, here’s a rare chance. Afterwards, be sure and visit The Center for Puppetry Arts’ museum to appreciate all the craftsmanship and detailed costuming that went into an actual Skeksis which appeared in the film. The screening is part of the Plaza’s Art Opening and a Movie series, featuring an opening reception for the exhibit “The Small Game of Revilo,” a collection of surprising sculptures featuring whimsical and fearsome small forest animals by Brian Colin which will be on display in the lobby through July 3. 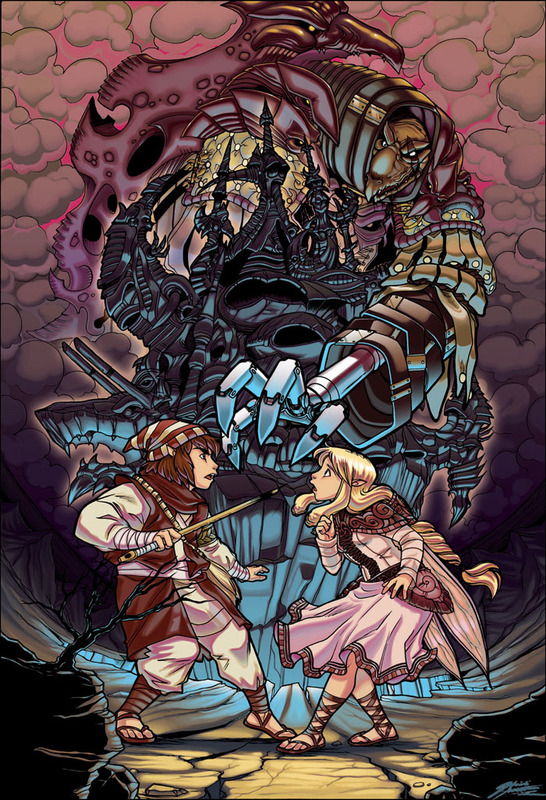 Also on hand will be Heidi Arnhold, the artist of two volumes of LEGENDS OF THE DARK CRYSTAL (THE GARTHIM WARS and TRIAL BY FIRE), a manga graphic novel prequel published by Tokyopop and set hundreds of years before the film. She’s also drawn a manga version of STAR TREK and is one of the artists for Archaia Entertainment’s upcoming FRAGGLE ROCK, VOL. 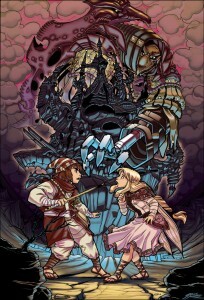 II anthology, out July 2011. 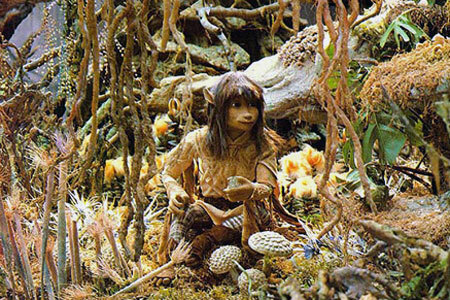 ATLRetro caught up with Heidi to find out how an unknown artist won a professional debut as cool as DARK CRYSTAL, why she thinks the movie has such staying power, and a little bit about her affection for rabbits. How did you get the opportunity to be the artist for LEGENDS OF THE DARK CRYSTAL? When I was a senior at the Savannah College of Art (SCAD), I met Tim Beedle [former Tokyopop editor] at Editor’s Day. The Sequential Art Department hosts the event once a year and invites editors from various publishers to visit and give portfolio reviews. I made [Tim] my top priority because my style seemed best suited for them. Much to my surprise and excitement, he liked my stuff and gave me his card! I walked out of the review room clutching it in my hands like he’d just given me the golden ticket. The evil Skesis, as drawn by Heidi Arnhold in LEGENDS OF THE DARK CRYSTAL (Tokyopop). I kept in touch with Tim after I graduated in hopes that a project in need of an artist would open up. Little did I know that he was working on LEGENDS at the time, and the first artist had decided to walk. Initially Tim had intended for me to work on something else, but he needed someone to take over the book fairly quickly. One day he asked me if I was a fan of THE DARK CRYSTAL, and I thought he was just making small talk and didn’t respond right away. Shortly afterward he hinted that there was a reason he was asking me that, and I got it through my thick skull that this could be my chance to move forward in the career of my dreams. After sending him sketches and several test pages over the next couple months, I was approved! Tim told me over the phone, and I did an awkward victory dance in the back room at my workplace—thank goodness nobody was looking! And that’s how it all began. Were you a big fan of the film already, and if yes, when did you first see it and what impact did it have on your art? When the prospect of illustrating LEGENDS was placed on the table, I’m embarrassed to say I had yet to see THE DARK CRYSTAL at all. I missed out on many awesome things when I was younger, mostly because VHS tapes were pretty costly—or so my parents tell me—and my family wasn’t doing so great financially. I never saw LABYRINTH or FRAGGLE ROCK as a kid either. I’m very glad I was able to grow up watching shows like SESAME STREET and MUPPET BABIES at least! 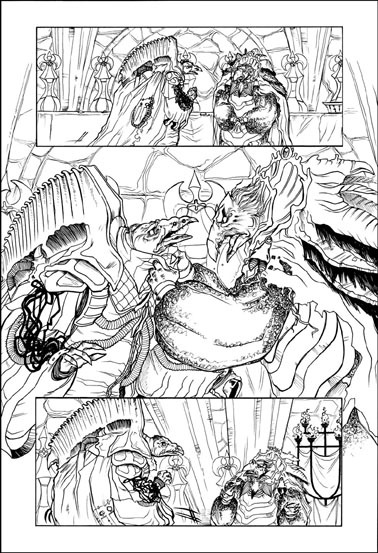 Another page drawn by Heidi Arnhold for LEGENDS OF THE DARK CRYSTAL (Tokyopop). However, once I had seen the movie, I was enchanted by the characters and backgrounds. I’ve always had a connection to the fantasy genre, its whimsical elements in particular. Even before I was green lit as the artist, I could tell the world of THE DARK CRYSTAL was going to give me the opportunity to cut loose and have some fun. Your artwork is very detailed and really makes the movie come to life in the graphic medium. How did you prepare, any funny stories and how many times did you visit the actual skeksis at the Center for Puppetry Arts museum? proportions to save my life. Tim was being so patient as he repeatedly tried to help me visualize how Skeksis were supposed to look. Before too long I began to have dreams about drawing the Chamberlain constantly, and I think that made something inside me die a little—I stopped sending revised drawings for a brief period after that. 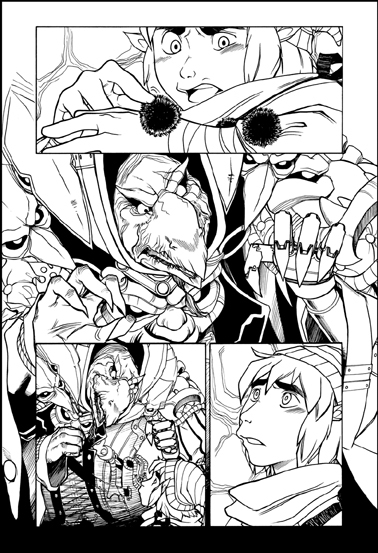 Tim graciously allowed me to send several test pages containing Gelflings only, claiming that I’d be able to draw Skeksis in my sleep the more I worked on the comic. Luckily, he was right! And yes, I did visit the Center of Puppetry Arts in 2008. I remember how exasperated I was, because I wish I had gone sooner! I could actually examine the Garthim Master up close, and I understood certain details in his robes much better in person than I ever would have from a screenshot. I was kicking myself that I’d never even considered going down there earlier to use such a valuable resource. DARK CRYSTAL was really groundbreaking in its use of puppetry in a feature film. How do you feel it holds up today and why should people come see it? The Dark Crystal has always been such a unique film to me. It gives a fascinating insight into the scope of Jim Henson’s vision, and it redefined the boundaries of puppetry, both technologically and in subject matter. I’ve never seen anything quite like it before or since. I think the movie sits in a specific category all its own, and for that reason it has earned a special place in cinematic history. Everyone should see it at least once! 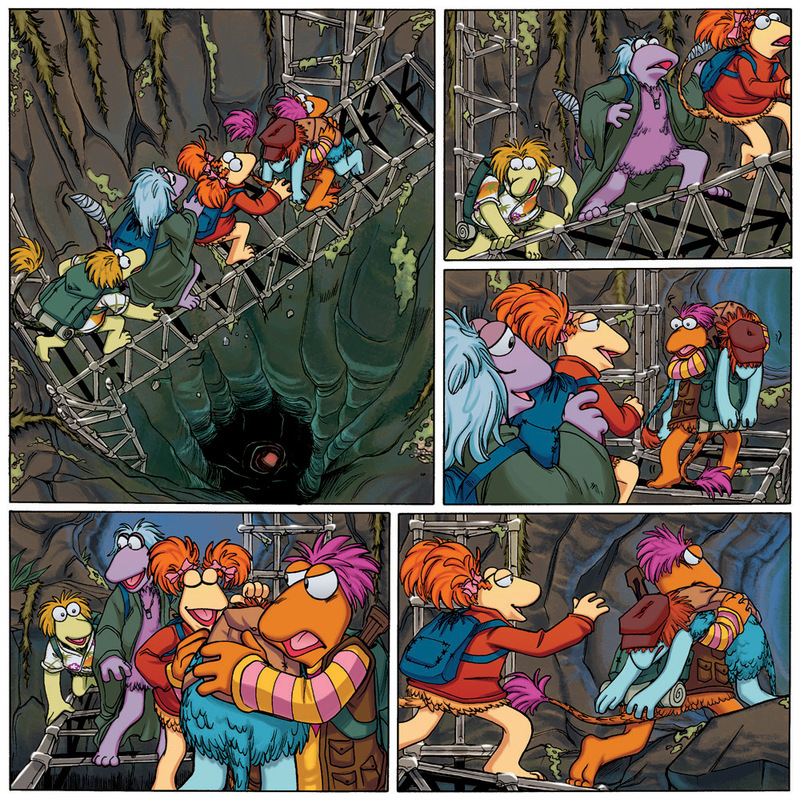 The cover of Archaia's FRAGGLE ROCK Vol. 2, coming July 2011. 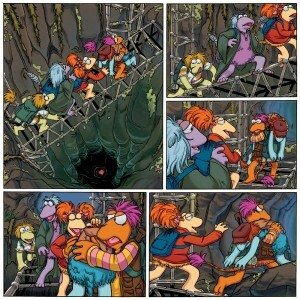 You’ve also drawn FRAGGLE ROCK for Archaia’s anthology. Is that out yet and what was that like and are those stories from the TV series or original ones? I illustrated a lead story for Volume 2 , Issue 2—that’s a mouthful, isn’t it?—titled “The Meaning of Life,” written by Joe LeFavi, which came out in January of this year. It’s part of a three-issue run that will be collected into a hardback book in the coming months. Volume 1 is already available, and I highly recommend it! All the stories in the anthology are original, and they really hold true to the feel of the show. 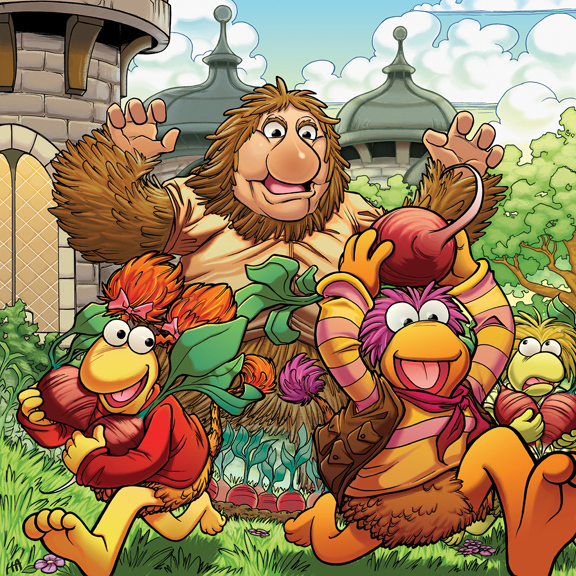 I think they’ll hit home with a lot of longstanding FRAGGLE fans and give newcomers a chance to fall in love with them as well. Currently I’m in a holding pattern to see if a project I’ve been visually conceptualizing will be picked up. The story is really fantastic, and I hope that we’ll be able to share it with everyone soon! In the meantime, I’m working on a short-term project that I’m also not allowed to talk about. I know, it’s super interesting, right? Being sworn to secrecy doesn’t make for fun interview responses. Finally, how many rabbits do you have and have you played with them today? I have three bunnies! Two boys, a Netherlands Dwarf and a Rex, and one girl, a Mini Rex. The boys are roommates and haven’t bonded with the girl yet, so playtime is sectioned off to different areas of the house. The boys have a room all to themselves, and my little lady is downstairs with me right now! She keeps nudging my feet while I’m sitting in my office chair, because she knows it will make me turn around and pet her. Bunnies are the BEST.